A few weeks ago I bought some cool paper napkins on a trip to Roger’s Gardens in Newport Beach, CA. I used them to make invitations to our Mother’s Day Brunch, and in keeping with that theme and color palette, I decided to make some DIY candle holders using the same napkins and Mod Podge. Take the napkin and peel the layers apart. I thought these were 2 ply at first, and turns out they were actually 3 ply. The thinner the paper, the more translucent your finished product will be. Cut the napkin into strips that are a little wider than what will fit your jar, so that you can wrap the paper underneath it. Coat the jar with Mod Podge and adhere the paper to the jar. Be gentle, as the paper is so thin. You don’t want it to tear. When dry, put an additional coat of Mod Podge over it and let dry. 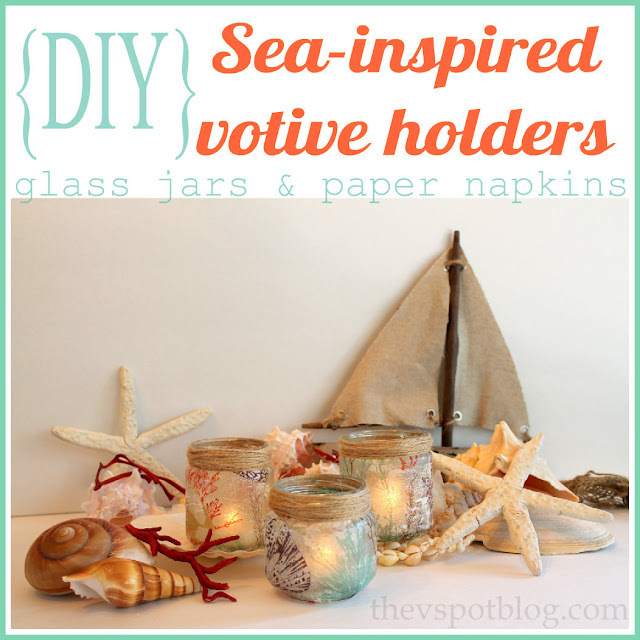 To finish off your votive holder, tie an end of twine around the neck of your jar, brush on a little Mod Podge to help “set” the twine, and wrap neck of the jar until it’s completely covered. Add a candle and enjoy! I’m really happy with how these turned out! I did some “Hurricane” sized ones for Halloween a few years ago, but I think I like this smaller size much better. By the way, the starfish in the photos above? I made them out of dough. Super easy to make. The red coral? I made that too. I have a tutorial where you can make it out of salt dough and another where you can create faux red coral with sticks and spray paint. Have you done any crafting with paper napkins before? What did you make? Oh, these are so cute for a summer party! 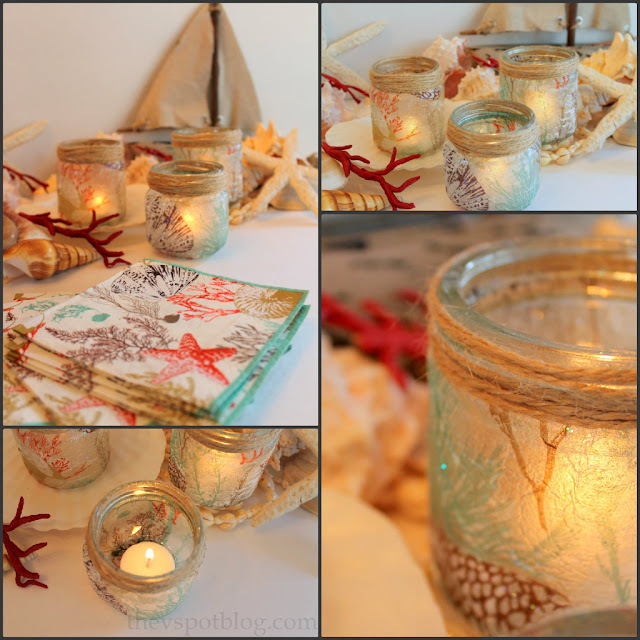 Love these glass jar votives! These are beautiful! Great project for summer. I love the napkin idea and I am all over your dough starfish!